Here are two of our favorite reads from this month. 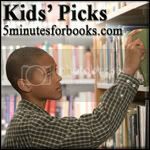 For more August kids' picks, visit 5 Minutes for Books. 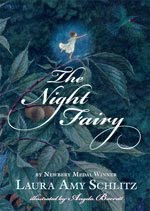 The Night Fairy is a fascinating, imaginative and spellbinding story about a small night fairy named Flory who makes the most of a difficult situation by using her survival instincts. She loses her wings when a bat mistakes her for a moth and she ends up falling into a giantess's garden. Resourceful, though sometimes selfish, Flory quickly learns how to cope in her new environment. With themes of friendship and forgiveness, the book beams brightly. Schlitz has a wonderful way with words and the fanciful illustrations by Barrett pair perfectly with this imaginative read. The full color pictures are so gorgeous and detailed, and my daughter spent a lot of time looking at them. I'd highly recommend the book to children interested in fairies and woodland animals. I read the book aloud to my 5 year old daughter and she loved it, especially the part featuring the hummingbird, though she did find the spider a little scary and felt sad when the fairy lost her wings. Most of the plot is slightly suspenseful so it might not be the right choice for very sensitive, younger readers. However, the book is perfect for provoking discussions on nature, bravery, friendships and survival in the animal world. I like the book so much I plan to purchase a copy for our home library. We see plenty of cows around our area, so it isn't surprising both my kids loved Mem Fox's A Particular Cow picture book. They must like the way the word "particular" sounds, too, because it appears on nearly every page spread. 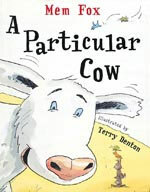 In this very silly and humorous book, one particular cow goes on particular walk on particular Saturday morning. A series of ridiculous, particular events occur after the cow gets a pair of bloomers caught on her head. Bloomers - not a word one usually finds in a picture book, but that is part of the charm of this read! Many of the involved characters make funny comments along the way and the comments are shown in word balloons. Denton's cartoonish illustrations greatly add to the hilarity. I found the book really fun to read aloud and we've read it nearly daily since we picked it up at the library. Simply and particularly silly! A Particular Cow sounds like something my boys would love! Thanks for sharing. Both of these sound like they'd be winners at our house! The Night Fairy sounds good. My 11-year old loves fairies, and fantasy type reads. I wonder if this book is a bit to below her reading level, interest. Then my 4-year old also loves Fairies but she may not be ready for this read's length. Hmm...I am going to keep this one in mind, see if my library has it. Thanks for putting it on my radar. These look great. I am especially drawn to the Mem Fox book. Thanks for sharing it! I LOVED the Night Fairy. Glad to hear you did also - so much that you'd purchase a copy for your home library. Awesome story! I used to love it when Kiddo would get attached to a "particular" word - for the longest time he used 'actually' in almost every sentence. The cow book sounds like lots of fun! Well who doesn't like cows?? My son likes big words, too, so this sounds like one we'd both like. A Particular Cow looks like it might go over well in this house, especially after our recent visit to the fair! I love books that are fun for everyone during read-alouds!